Watching the All Blacks play a Rugby World Cup game at home has to be one of the top things for any rugby fan to aspire to. 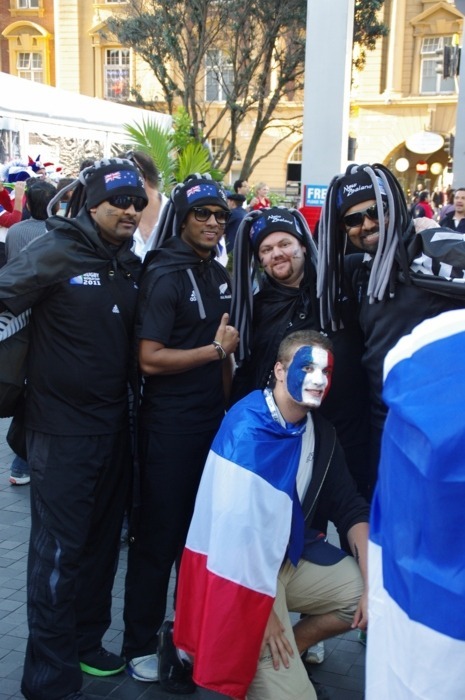 So, when I saw that the All Blacks were playing against France on Saturday night, I decided to fly up to Auckland a day early and see if I could find a ticket for the game. Fortunately for me, there was no problem changing the flight, and only a $20NZ change fee. So, I found a motel room and decided to go for it. 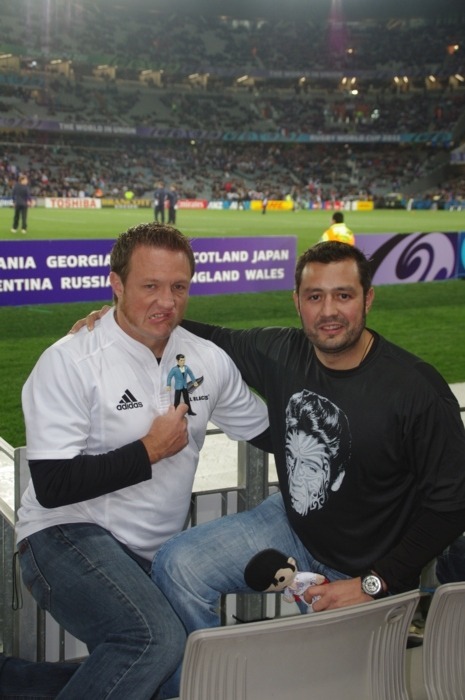 At the airport, I saw a group of guys wearing shirts that made me chuckle – they were from a rugby club in Memphis, and their shirts had a large image of Elvis sporting Maori tattoos. After the flight, I found myself walking over to the baggage lockers behind a few guys from that club. I caught up to them and complimented them on their shirts. I mentioned that I was planning to try to attend the game, and, as it turned out, they had an extra ticket. 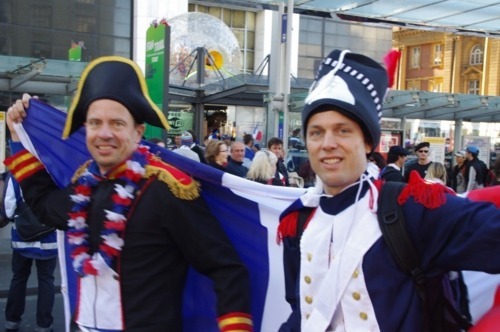 It was a total carnival atmosphere both in town and at the stadium, as you can see from the photos. I met Chris from Memphis at the stadium, and it turned out that the seats were absolutely awesome – six rows from the field, right by the 22 meter line. 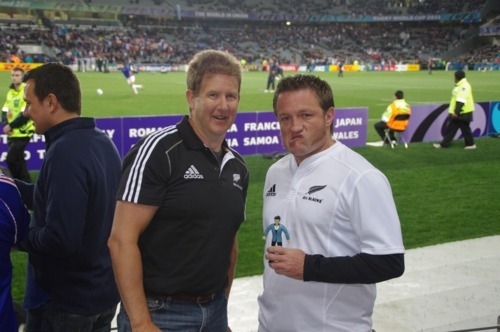 The game was awesome, All Blacks won, their captain Richie McCaw played his 100th match, it was almost too good to be true! I’ll be uploading some pics soon! I told you I would not bore you with the work-related part of the trip – and I won’t. But I will relate a few amusing or interesting tidbits. 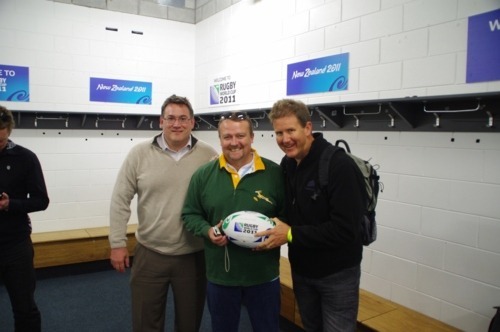 And in order to do that, I need to let you know the general reason we were there – which was  to brief the Australian technical press on latest product and company developments,  present at a small conference on Digital Content Creation, and  endear ourselves to the Aussie press by taking them to a rugby game. 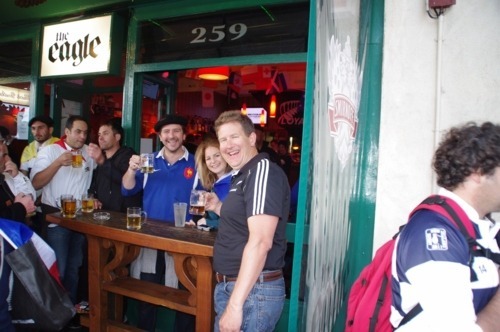 And, as all three of the hosts (myself, Chris from Intel, and Tim from Gigabyte) were former rugby players, we were not averse to watching a little rugby ourselves! The first thing that I wanted to mention was that we quickly discovered that the USA Rugby team was staying in our hotel. And I’ll have to say, I was very impressed with them. In spite of being international athletes, they were polite and humble, and represented the USA well. 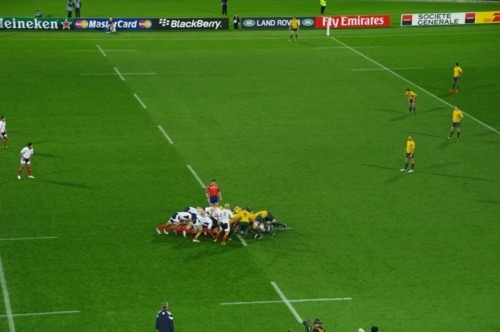 As the USA is not a premier international rugby side, there were up against some long odds, knowing they were going to face some teams that were much superior to them. I was impressed with how they handled themselves. Another thing that was a big surprise was the VIP treatment that we somehow received. It seemed like the conference organizers somehow got the impression that Chris, Tim, and myself were some sort of bigwigs that merited special treatment. 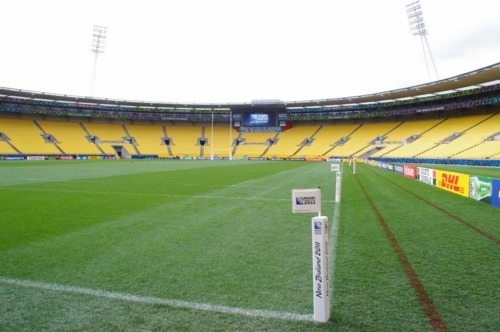 We suddenly found ourselves on special private stadium tours, a long tour of WETA (more on that later) and an upgrade to the luxury box at midfield at the big USA vs. Australia rugby game! We were both bemused and a bit worried by this, expecting that any moment the curtain would be pulled back to reveal that we were just a few techies that happen to like rugby, but it never happened. We represented ourselves honestly, had a lovely time with everyone, and left still a bit puzzled on why everyone was so great to us! But of course, no complaints! Chris from Intel, Tim from Gigabyte, and me. USA vs, Australia. We got stomped, 67-5. As part of our “VIP” treatment, we were given a two hour tour of WETA, the studios that produced the Lord of The Rings, much of the effects for Avatar, and other heavily computer-generated movies. Now this was INCREDIBLY cool. We got to see original Lors of the Rings scenes, shot against green screens in studio lots, then got to see how they were converted into final movie scenes. We saw how they took the facial images of real actors and made them into fantastic characters like Golom from Lord of the Rings, or the Avatar characters. We got to go into sound mixing studios the size of actual movie theaters hand hear how things are really MEANT to sound. And we got to see 3D trailers for upcoming movies that no one outside of WETA had even seen yet. It was fascinating, total geek heaven, and we felt truly privileged to have that experience. They even fed us tea and pastries before sending us on our way! Truly memorable. This entry was posted in Travel on September 25, 2011 by John Beekley. I awoke Wednesday knowing that my jaunt was coming to an end. I had to be in Wellington by 3PM or so to meet with my colleagues from partner companies and with the technical press from Australia. That, of course, is what had ostensibly brought me to New Zealand in the first place. The weather wasn’t great and I was not loaded with time, so I decided to drive up the river for a bit into Whanganui National Park and see if I couldn’t rent a kayak and paddle around for a bit. So, I took off in my car to drive up the river. The road, which was lovely as always, quickly became a small country road, with no painted lines and decaying pavement, and only one lane wide in many places. 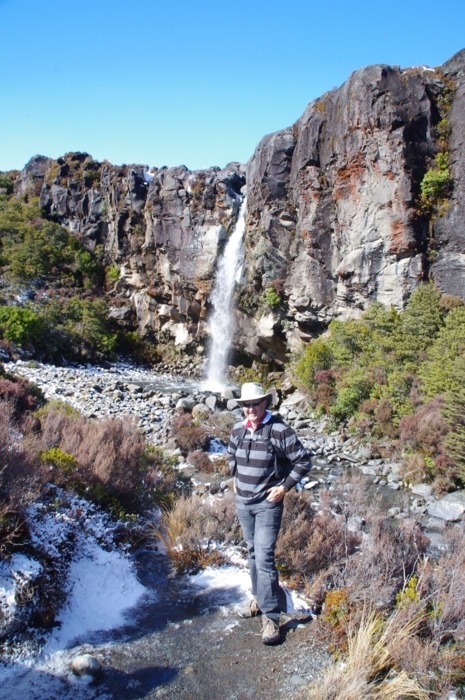 This was not the first time that I had underestimated just how rural New Zealand really is! 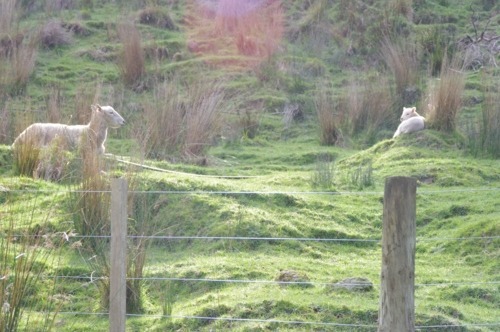 Once again, there were charming flocks of sheep everywhere, with countless sweet little lambs that would run to their mothers every time I would stop the car to try and take a picture. It became obvious pretty quickly that I would not be kayaking, so I drove up the river for an hour or so and turned around. 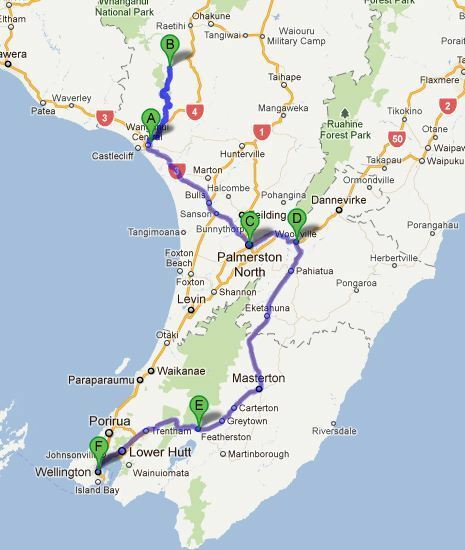 I figured I would start to work my way towards Wellington, maybe take the scenic route and stop at a couple wineries along the way. There is actually a full page advertisement in the Air New Zealand magazine, the title of which is “Allow Extra Time on New Zealand Roads”. The ad goes on to say “Roads in New Zealand might be different than what you’re used to back home…” Truer words were never spoke. By the time I was approaching the wine country, I realized I was going to need to hustle to get to Wellington on time. And as I was weaving my way up the 1500 foot mountain pass to get into town, I realized I would be lucky to get there 45 minutes late! Which is about what I managed to do. 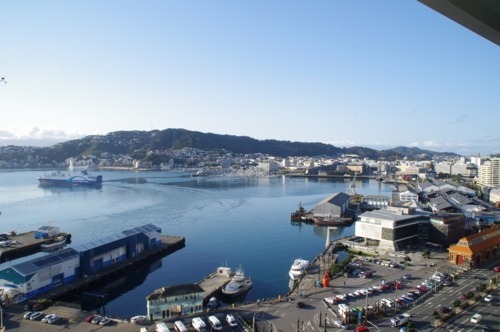 I had not heard great things about Wellington from other people and from various tourbooks, so I was very pleasantly surprised to find it a very charming small city. Surrounded by water, with a vibrant waterfront and boating scene, active café and restaurant vibe, and interesting architecture, it was a great place to spend a few days. I dumped the rental car, met up with everyone, and started the “professional” portion of the trip – the details of which I do not intend to bore you with. I didn’t sleep so well on Monday night, I’m afraid. The motel I was staying at, which bills itself as “the highest Hotel in NZ”, was being rocked by strong gusts of wind. And, the mattress in my room (the last room they had, apparently) was sagging. And, someone on tripadvisor claimed there were bedbugs. All this combined for a less than stellar rest! When I crawled out of bed at 6:30 or so and peered through the curtains, I was pleasantly surprised to find that the wind had cleared the clouds away, and the area was coated with a light dusting of snow. I threw on some clothes and went outside to have a look around, and found that it was cool, crisp, and lovely, with gusty winds. During the night I was trying to decide whether to ski for a half day, or find something else to do. As it turned out, the weather made the decision for me – all ski areas were closed due to the high winds. Ah, just as well, I would have really had to improvise to put together the necessary ski gear! Instead of skiing, I decided to do some hiking. The trailhead for the hike to Taranaki Falls, a two hour loop, was just a few hundred feet from the hotel. I got dressed for some wintry hiking, and took off down the trail. The hiking was fantastic. This area, Tongariro National Park, was used for a few locations in Lord of the Rings (Mordor and Mount Doom, if you must know) and was suitably awesome and mysterious. The trail altered between damp woods and open lava flows, with the volcanoes above shrouded in clouds and mist. As it was early, I had the trail nearly to myself. After completing the loop, I took the quick jaunt to Tawhai Falls, another waterfall which is just half a kilometer from the road. I took a few pictures, and noticed that it had started to snow. Getting back to the car and looking around, I noticed that the clouds were starting to look a bit threatening. So, I decided to head to Okupata Caves. Figured I could hide in a cave if the weather started to get rough! I started heading to the caves, but the road quickly became a lumber road. I started to get tired and depressed driving through kilometer after kilometer of clearcut lumbering debris, so I decided to bail on the cave idea. 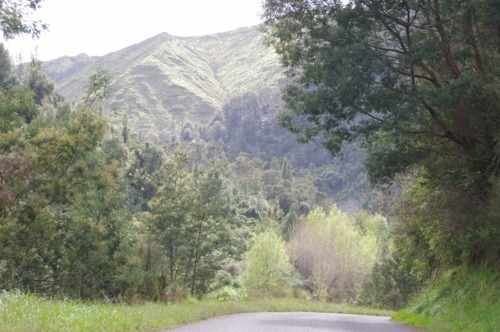 In fact, that has been the only real downer on my travels through the New Zealand countryside – the lumber business is very apparent here, and you frequently come across hillsides thar are scarred by heavy lumbering. Instead of caving, I decided to hike for a bit on the Tongariro Alpine Crossing, one of the most famous hiking trails in New Zealand. I hiked up to Soda Springs and back, about 2.5 miles each way through highly volcanic terrain. 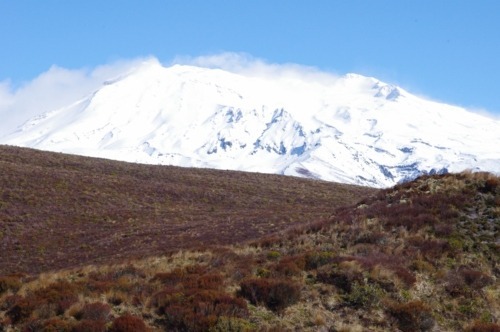 The weather was crisp and beautiful, and the trail climbed up into the valley between two snow-covered volcanoes. By the time I got to Soda Springs, I was tramping through six inches of crusty snow. Perfect place to turn around! At this point, it was fairly late in the afternoon. 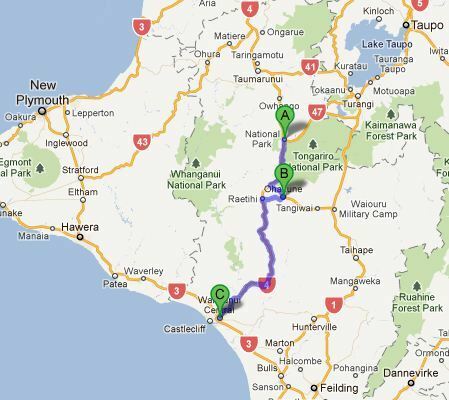 I decided to continue working my way towards Wellington, and headed down the road towards Wanganui. Again, a beautiful drive through grass and forest covered mountains, with sheep and cattle everywhere. 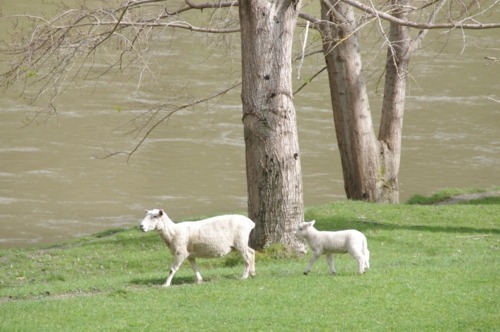 It was clear that the animals all have their babies this time of year, as there were lambs and calves everywhere. Very sweet and pastoral. At one point, I came around the bend and there was a flock of about thirty peacocks in the trees and on fenceposts – something I have never seen before! This entry was posted in Travel on September 22, 2011 by John Beekley. To my great delight and amusement, my favorite placebo, melatonin, was effective once again, allowing me to sleep right through ‘til morning. No jet lag for this kid! Awoke at about 6:30, and was on the road by 7:30 or so. Walked down to the dunes to check out the beach, stopped at the local bakery and got a fresh bacon-and-egg pie for breakfast, and away I went. I decided to drive up towards Lake Taupo, in the center of the North Island, up near the volcanoes. There is lots of stuff to do in that area, including jet boats. At some point or another I had decided that my New Zealand trip would not be complete without a jet boat ride, so I thought perhaps this would be my chance. Unfortunately, the weather was not very cooperative today. Clouds built all during the morning, and by the time I was nearing Lake Taupo it was starting to drizzle on and off. I had known before I left California that the weather was not going to be ideal, however, and had consciously decided that I would try not to let this deter me. Keeping this in mind, when I reached the Aratiatia rapids, I donned my raincoat and went on the short hike out to see the rapids. They were quite a spectacle, worth enduring the dampness. These rapids are directly downstream from the spillway of a dam, and this spillway is opened at scheduled intervals throughout the day. When they open, the river changes from a gentle gurgling stream to a raging, emerald-blue torrent. And then goes back again in 45 minutes or so. Peculiar, but spectacular! Stopped in Taupo for a late lunch. Had an awesome hamburger, juicy hand-made burger on homemade roll, with cheese, bacon, egg, and all the fixings. Never had a fried egg on a burger before, I’ll have to say it was actually pretty good! 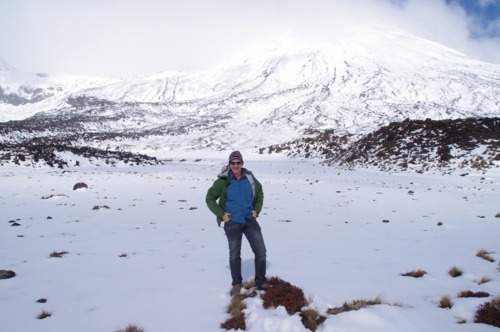 Decided to continue to the south end of the lake, then up towards Tongariro, one of New Zealand’s most famous national parks. On the way I stopped in Tokaanu, which has a bunch of hot springs. I decided to try the mineral baths, kinda fun, soak in a tub of hot minerally water for 20 minutes or so. Definitely relaxing, more so than I thought it would be. Afterwards, there was a short walk around all the springs, mudpots, vents, etc. It was dusk, and the mood of the place was very primeval – tropical woods, dark, moisture dripping from the branches, bubbling mud pots and clear springs, with steam everywhere. Very jurassic-feeling. Drove up the mountains in the foggy dusk, not much to see. Hoping that the weather has cleared enough in the morning to catch a glimpse! This entry was posted in Travel on September 21, 2011 by John Beekley. First day in New Zealand! 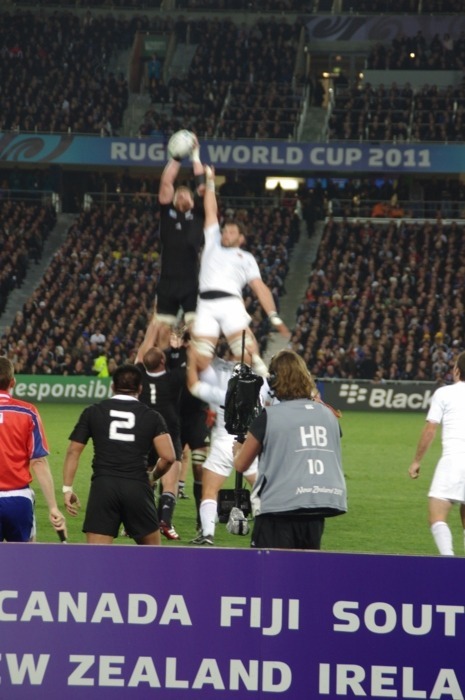 Rugby fever has definitely gripped New Zealand – I could sense it before the plane even took off. The airline magazine, the posters on the jetway, and even the safety video features the All Blacks. In Auckland airport, you could buy a full size rugby ball for two dollars – from a vending machine! I got bitten by the fever myself, and decided to head down to Hamilton to try to obtain a ticket for this afternoon’s match between Wales and Samoa. Unfortunately, there were no tickets to be had, the match was completely sold out. I did, however, run into a bunch of guys from the Wales team at their hotel, where I had stopped to ask the concierge about tickets. But that was it… so I had some coffee and then hit the road. Speaking of coffee, I am definitely taking advantage of the fact that New Zealand has a thriving coffee culture. Starting from the cappuccino I got from the Airstream trailer parked right outside baggage claim, all the coffee I have had has been excellent – and not a Starbucks in sight! Thank goodness, too, because I certainly need it. After giving up on the rugby game, I decided to head up to the Coromandel peninsula. The drive along the coast was outstanding, and I had some grilled local oysters for lunch. After yet another coffee (something they call a “flat white”, which seems to be somewhere in between a cappuccino and a latte) I continued my drive, up over the spine of the peninsula and over to Cathedral cove, which is known as one of the most beautiful beaches in NZ. Cathedral Cove was a forty-five minute walk from the parking lot, through meadows and a semi-tropical forests. The beach definitely lived up to its billing. On the way back, I got caught in a downpour, while my raincoat was staying nice and dry in the car. Fish and chips in the motel room for dinner, rinsed down with Speight’s New Zealand Ale. Early bed time tonight! This entry was posted in Travel on September 19, 2011 by John Beekley.